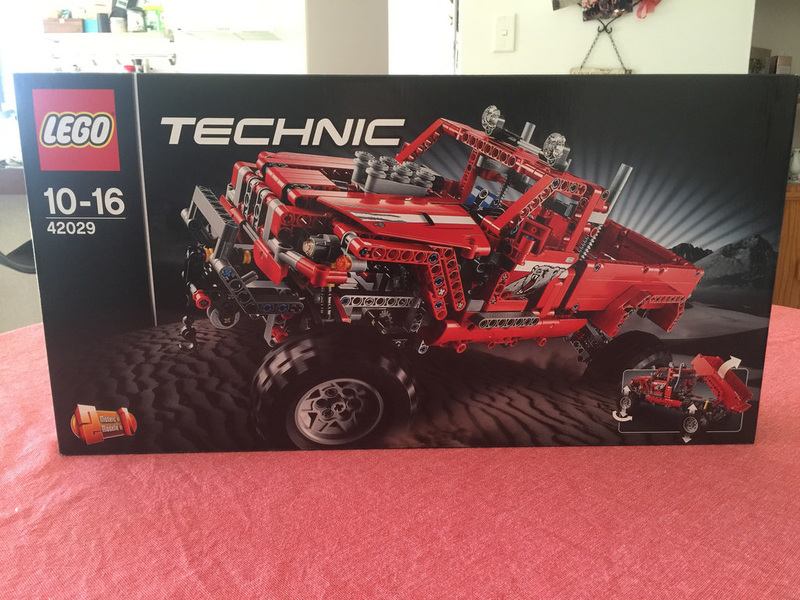 It’s been a very long time since I’ve had a Technic set to build. I don’t even remember the last one I had as a kid! 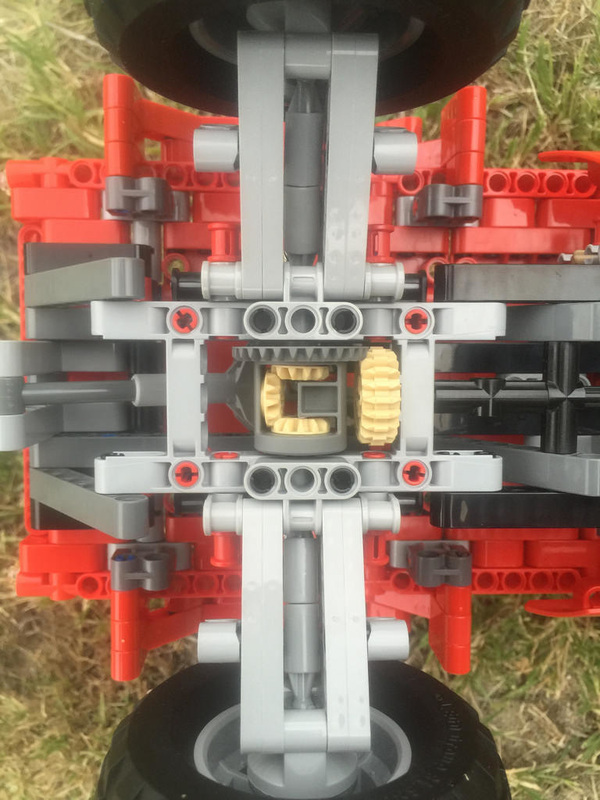 Technic sets are known to be intricate, sometimes fiddly, and often chock full of detail and functionality. This set is no different. The main thing I noticed with this set was the size. It’s big. Really big! It measures in at 41cm long, 20cm wide and just under 20cm high. 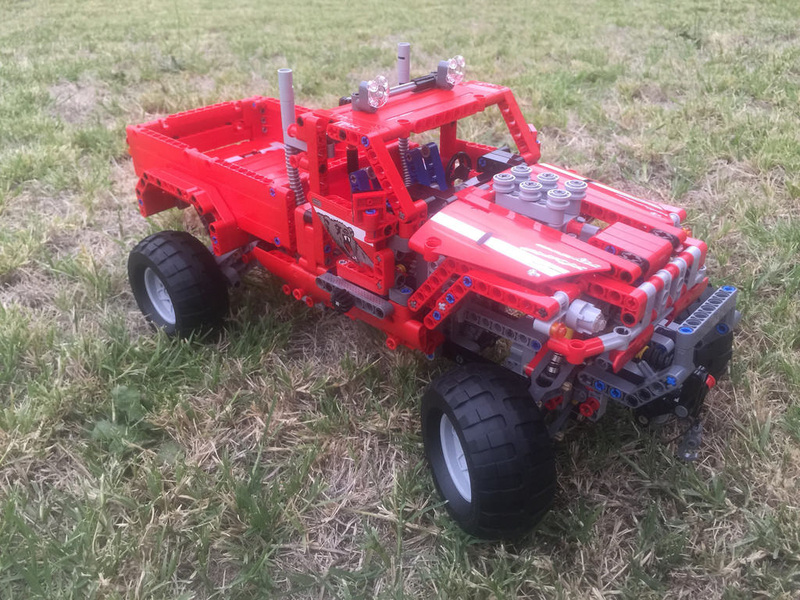 It’s brilliant, and as a 4×4 fan, I was really happy with the product. Let’s get into the review. 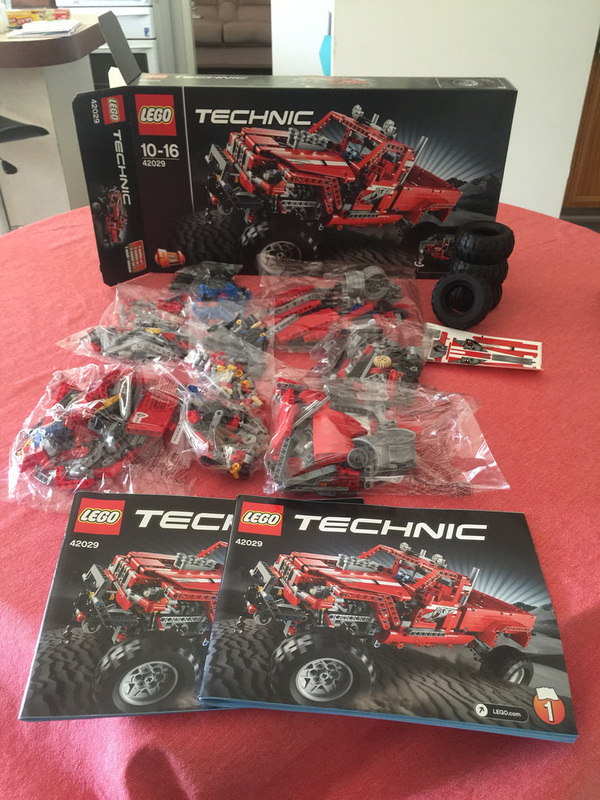 Out of the box you will get 11 parts bags, four big tyres, two instruction manuals and a sticker sheet with nine stickers. There’s no brand new moulds with this set, but two of the panel parts (the flat and the bowed) are new in red. 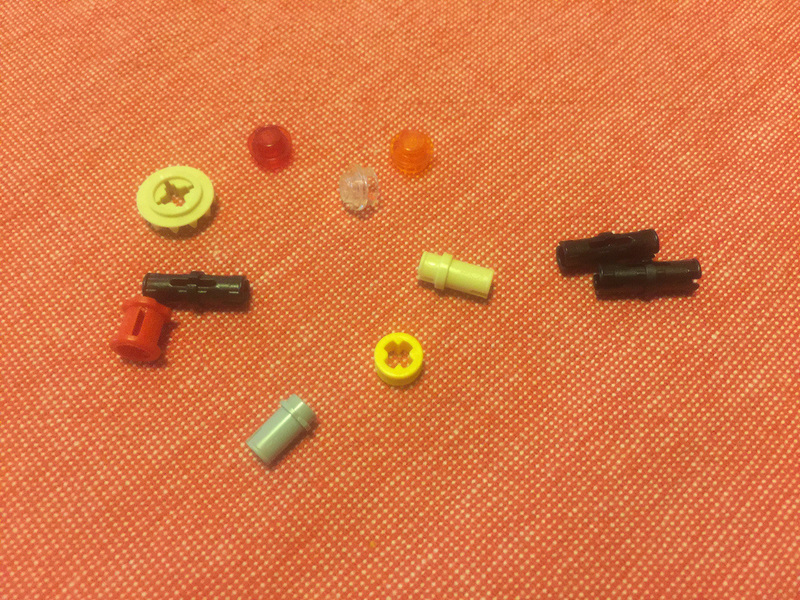 Aside from those, there’s plenty of parts that are very useful, but are common to many Technic sets. I’m not going to list them all, as there are too many. This set is chock full of goodies! Plenty of vehicles can be made from these parts. Nothing special with the spares this time. 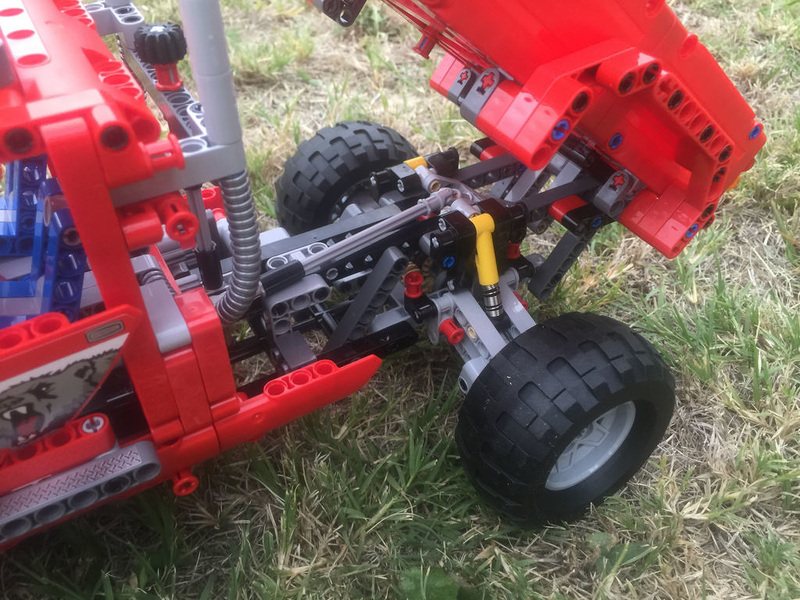 It’s exactly what you’d expect from a Technic set! Pins, some transparent 1×1 round plates and a gear. 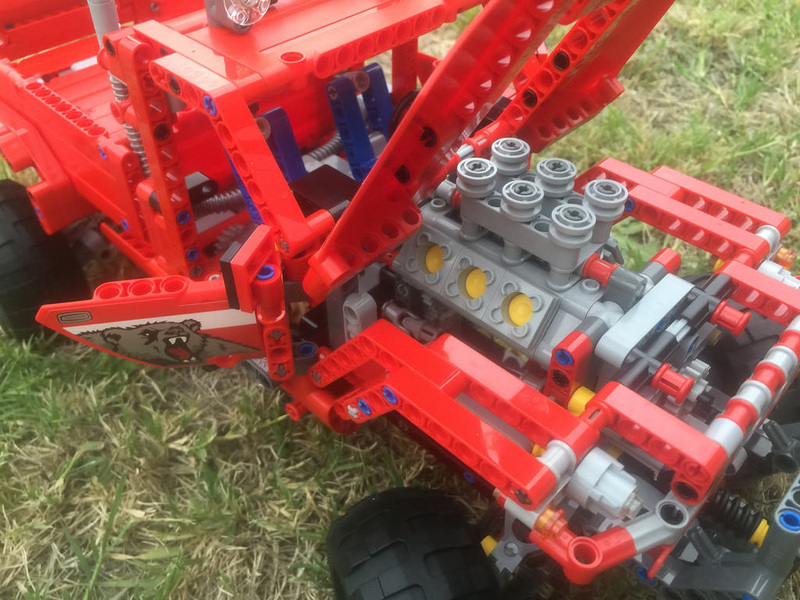 The build, like all Technic vehicles, is full of complexities and gears. It’s not too challenging, but can be a little fiddly at times. You start with the rear differential. It’s a tight little knot of cogs, and works like a charm. After that, you move along the chassis with the construction of the tray tipper. It’s pretty incredible to build as you realise when you go along what part it is you are building. Next it’s on to the cabin which is attached to the chassis, then it’s on to the engine. It’s great to be able to see the pistons pumping through. The basic frame is added to the hood, and the first book is done. The second book starts with the doors, followed by the front axle and steering mechanism. It looks pretty great. When building the winch I found it a little bit stiff and tight, but it works. I’m hoping it will loosen up with more use. Following on from that are the details like front grill, mudguards, side steps, finishing of the hood and mirrors. I particularly like the headlights at the top of the cab. Finally, the tray is built and attached, the wheels are added, and the model is complete. It is an absolute beauty. It’s really strong and durable and can take a decent drop thanks to the suspension. It looks great. I’ve since added on a Power Functions kit to get the winch and tray moving by themselves. It’s great to watch. A few changes and tweaks and the upgrade is complete! I’m a little disappointed that the steering and drive train can’t be motorised, but there’s always someone that has done it! That’s the next step. This model is absolutely brilliant, and sits on my display shelf with pride. There is a different model to create with this, but being a 4×4 fan, I can’t bring myself to dismantle it yet. I’m thrilled with this set. The travel is incredible, it looks mean, and can take a beating. 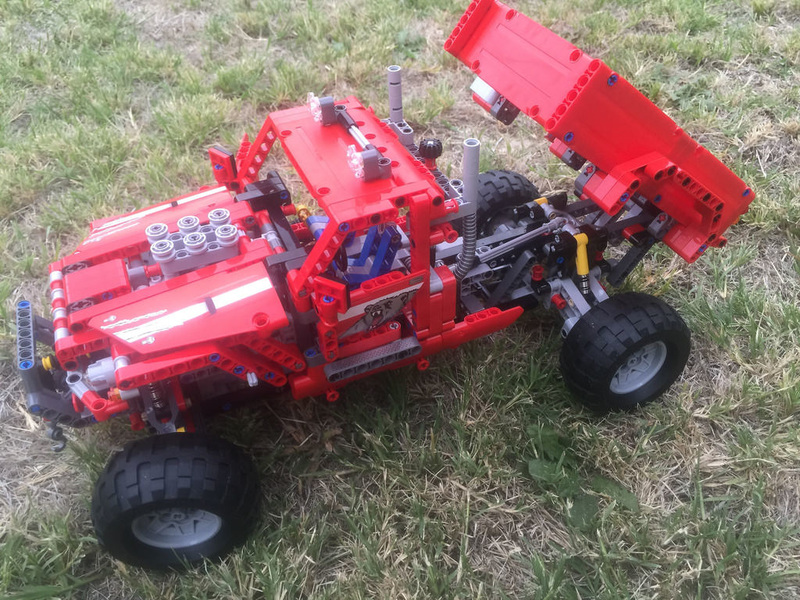 There’s some great parts in there for vehicle fans, it’s definitely useable, the build is great – not repetitive at all, and it’s just great to look at. Overall this set gets 9 out of 10 chunky tyres. An instructed option for remote control would have got it to 10. Next review is 60061: Airport Fire Truck, but I’m on holidays for a while, so there won’t be a review until the second week of June. I’ve decided to give myself a decent break and catch up on a bit of writing. Expect some new reviews when I return! Remember, feel free to leave a comment below or get in contact with me on Facebook.